Walking distance to everything in Breckenridge, any Blazing Saddles condo for sale will be small and modest, designed to be everything a ski fanatic, or a couple, needed for a relaxing ski vacation. This is the kind of get away where you could park the car and not scrape the windshield until it was time to leave. Parking is tight in downtown Breckenridge, but there is plenty around these condos. In the front, a large lot accommodates retail shoppers and residents, and another, riverside lot, is reserved primarily for residents. Studio apartments and one bedrooms are available in this complex and many units have good storage closets. Keep reading about the condos for sale, or find available Blazing Saddles condominium listings below. 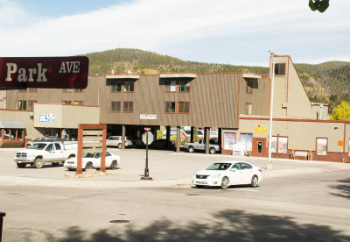 Located above a ski shop, liquor store and quiet restaurant, Blazing Saddles Condos are across the street from the town end of the Four O’clock run and on a bus stop. Take the free ride straight to the base of the mountain and ski home at the end of the day – via Four O’clock Run. Blazing Saddles Condo are next to the Riverwalk Center, between Park Avenue and Main Street, and while this is a very town center address, the nearest byway – add the edgeof the parking lot, is the Blue River. There are just a couple of street level entrances to Blazing Saddles, and most of the units are up a flight of stairs, which makes the view from any condo pretty incredible. Each condo entrance is off a central hallway and the distinction between units will be whether they face the east – morning sun and panoramic Baldy Mountain views, or to the west – evening sun and facing toward the ski mountain. Size: 400 or 809 sq. ft. Amenities: location at the center of town overlooking the lawn of the Riverwalk Center and the central plaza. Off street parking. Nice views. From the traffic circle on the north side of Breckenridge take the Park Avenue exit and continue to the center of town, and the intersection with Ski Hill Road. Continue through the light and Blazing Saddles will be the second condo building on the left, set back off the road slightly above a few retail shops like Lone Star Sports. 110 S. Park Ave.
Are you ready to start your search for that perfect condo in Breckenridge? Get in touch today for free information about the local real estate market.